Pigs - Family Suidae. Photo © Sylvain Cordier / Getty Images. Hogs and pigs (Suidae), also known as suids, are a group of mammals that includes domestic pigs, babirusas, pigs, warthogs, forest hogs, red river pigs, and bushpigs. There are sixteen species of hogs and pigs alive today. Hogs and pigs are stout, medium-sized mammals that have a stocky torso, an elongated head, short legs, and small pointed ears. Their eyes are often small and positioned high on the skull. Hogs and pigs have a distinct snout, the tip of which consists of a round cartilaginous disc (called nasal disc) with their nostrils on the end. The nasal disc is attached to muscles that enables pig to move their nose with precision as they sniff their way along the ground foraging for food. Hogs and pigs have an acute sense of smell and a well-developed sense of hearing. Hogs and pigs have four toes on each foot and are therefore classified among the even-toed hoofed mammals. 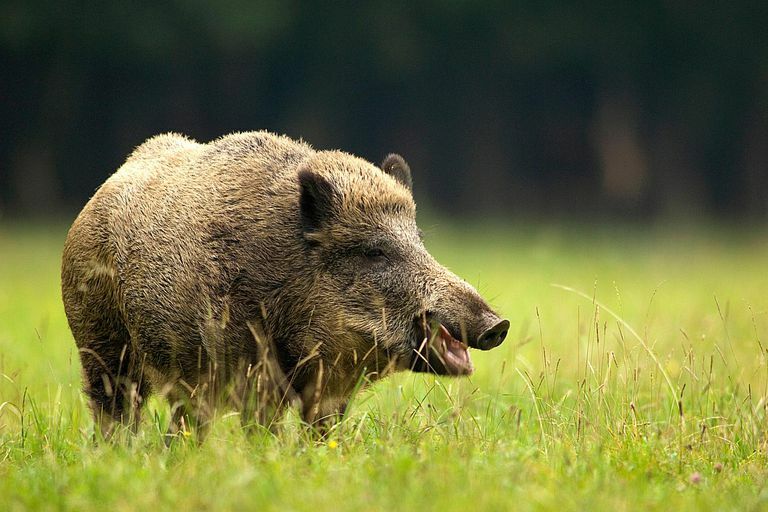 Hogs and pigs walk on their middle two toes and their outside two toes are placed higher on their leg and do not come into contact with the ground when they walk. Hogs and pigs range in size from the pygmy hog (Porcula salvania)—a critically endangered pig that when full grown measures less than 12 inches tall and weighs less than 25 pounds—to the giant forest hog (Hylochoerus meinertzhageni)—a bulky suid that grows to more than 3.5 feet tall at the shoulder and weighs in at an impressive 350 pounds or more. Adult female hogs and pigs and juveniles form groups known as sounders. Adult males either remain solitary or form small bachelor groups. Pigs are not usually territorial and exhibit aggression between individuals during the mating season. Hogs and pigs once inhabited a native range that extended across Europe, Asia, and Africa. Humans introduced domesticated pigs, derived from the species Sus scrofa, to areas throughout the world including North America, New Zealand, and New Guinea. Fossil hogs and pigs occur in the Oligocene in Europe and Asia and in the Miocene of Africa. Babirusa (Babyrousa) - There are four species of babirusa alive today. Members of this group include the golden babirusa, Sulawesi babirusa, Togian babirusa, and Bola Batu babirusa. Babirusa are noted for the long upper canine teeth that, in males, curve back over their face. Warthogs (Phacochoerus) - There are two species of warthogs alive today, the desert warthog and the common warthog. Warthogs inhabit the dry grasslands and scrublands of sub-Saharan Africa. Forest hogs (Hylochoerus) - There is one species of forest hog alive today, the giant forest hog, Hylochoerus meinertzhageni. The giant forest hog is considered to be the largest wild member of the Suidae. The giant forest hog inhabits woodland habitats in central Africa. Bushpigs and red river hogs (Potamochoerus) - Only two living species belong to this group, the bushpig (Potamochoerus larvatus) and the red river hog (Potamochoerus porcus). Both species inhabit sub-Saharan Africa. Domestic and wild pigs (Sus) - There are six species of pigs alive today. Members of this group include domestic pigs and wild boar (Sus scrofa), Visayan warty pigs (Sus cebifrons), and Philippine warty pigs (Sus philippensis).